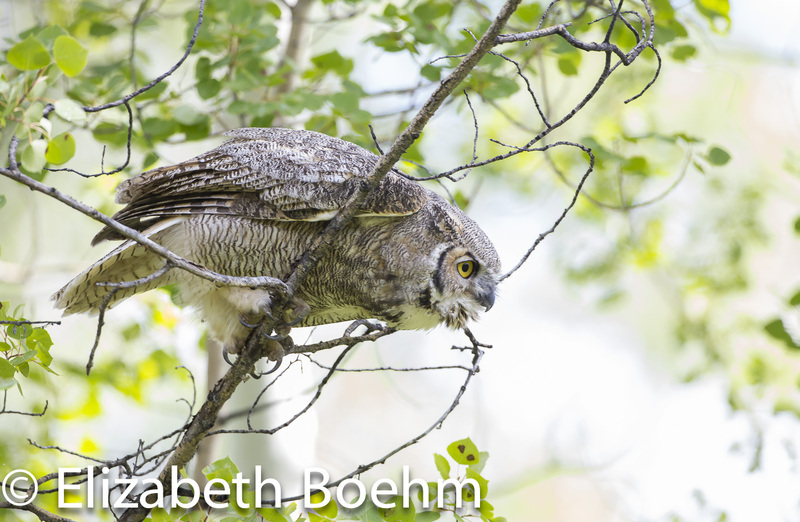 I was asked recently how I knew this Great Horned Owl was a juvenile of the year. It made me stop and think. I now had to put my observations into words which was a bit difficult as there are a number of things that came automatically that made me think “young bird”; any one of which would not necessarily stand on its own. First of all, I frequent this particular aspen grove off and on throughout the summer. 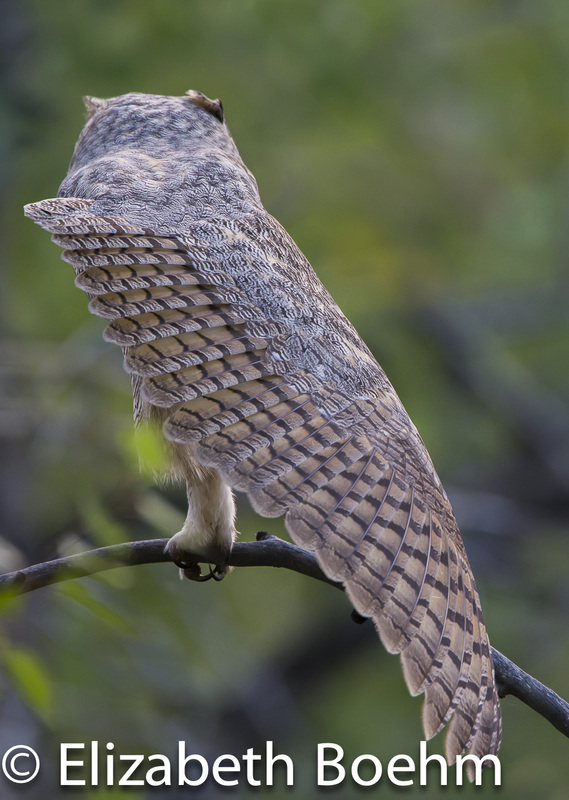 I have unintentionally flushed an adult Great Horned Owl on a number of occasions and it flew out of my sight quickly, not to be seen again that day. I knew there was a nest close by but I was unable to locate it as I was adjacent to private property. This young owl did not flush immediately but seemed to take an interest in me and had little fear. It was also very alert and paid attention to the goings-on around it. I found it on several occasions sitting out in the open on a lower branch or stump. I would say an adult Great Horned would find a quiet, hidden spot in the trees to roost for the day and try not to be detected by alarmist birds such as the American Robin. Also, the young owl’s feathering was clean and all primaries and tail feathers were lined out nicely with no ragged edges. It looked as though it had an entirely new “coat” of feathers which would be true of a September juvenile. I also took a good look at my photos upon returning home and could see the feathers around the eyes were not fully developed. The final clincher, which did not happen until later in the second morning of watching, was a juvenile begging call. 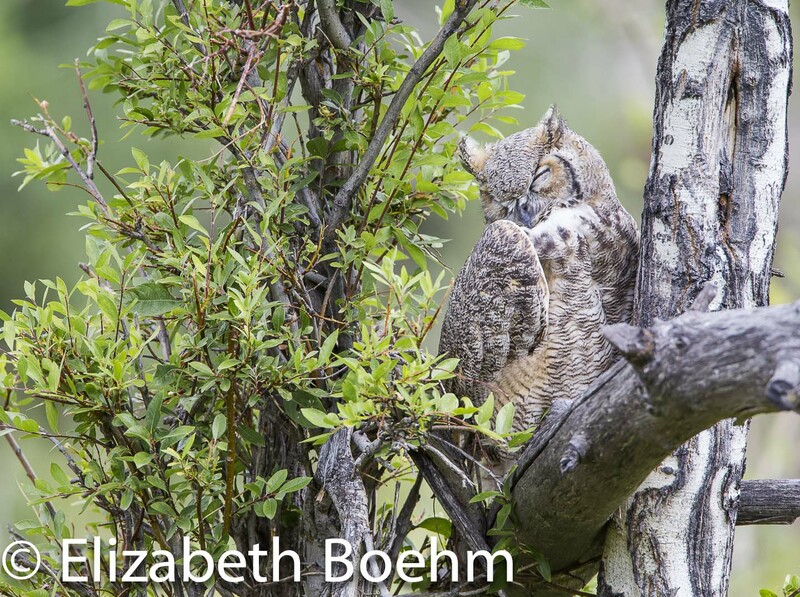 The call is a “squawky- screech”; nothing that sounds like a typical owl hoot. I did have the opportunity to watch this young bird (from a respectable distance) for a number of hours on several mornings. This time is when I learn the most and really take in some good behavior which becomes imbedded into my brain subconsciously making it difficult to describe “How I know”. 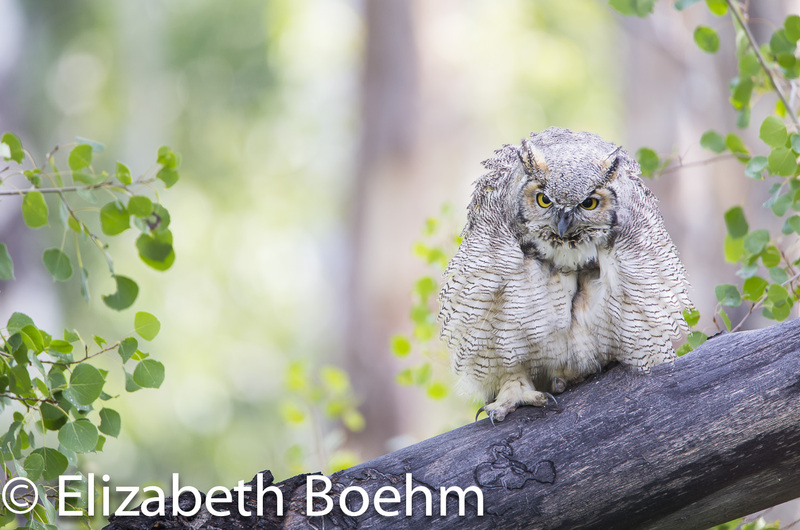 I was out birding this morning and came across this beautiful Great-horned Owl. It moved around a bit in the aspen grove looking as though it was trying to hunt but didn’t seem overly disturbed by my presence. It finally settled on this fallen tree for a roost site. I decided this bird to be a young-of-the-year owl with it’s fresh looking plumage and it’s curiosity and tolerance of this photographer. I always try to disturb my wildlife subjects as little as possible as I like to document natural behavior. This young owl paid me the ultimate compliment by falling a sleep in front of my camera lens.